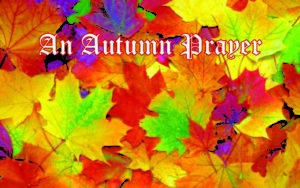 O God of Creation, You have blessed us with the changing of the seasons. As we embrace these autumn months, may the earlier setting of the sun remind us to take time to rest. May the crunch of the leaves beneath our feet remind us of the brevity of this earthly life. May the steam of our breath in the cool air remind us that it is You who give us Your Breath of Life. May the scurrying of the squirrels and the migration of the birds remind us that You call us to follow Your Will. We praise You for Your goodness forever and ever. Amen. Why is there such a collection? Every year, the Bishops of Canada make an appeal for financial assistance to support its work through the Collection for the Needs of the Church in Canada. As noted by the President of the Canadian Conference of Catholic Bishops (CCCB), the Most Reverend Richard Smith, Archbishop of Edmonton, this collection helps support the work of the Episcopal conference by providing each diocese the means to make its annual per capita contribution to the CCCB. “Any amount exceeding this contribution is then put at the disposal of the dioceses for their own pastoral needs,” Archbishop Smith explains. The CCCB is the national assembly of Catholic Bishops in Canada, including the Eastern Catholic Churches in Canada. The Collection for the Needs of the Church in Canada will be held in our parish on September 29th and 30th. Through your contribution to the collection, you too can collaborate with the Bishops in their ministry to teach, sanctify and govern. Please be aware that the Archdiocese of Toronto has received multiple reports from parishes that criminals have created Gmail accounts in various pastors’ names, asking for iTunes gift cards for a sick friend in the hospital. If you receive this email, do not respond and forward the message to the Help Desk at helpdesk@archtoronto.org. Starting Wednesday, October 3rd, there will be a change in the office staff. 10 a.m. until 4 p.m. Please welcome Colleen Murphy, who will be replacing Sandra in the office commencing October 3rd, 2018! CORNER OF KEELE & BLOOR 2-3 P.M. SO WHAT IS LIFE CHAIN? A small pro-life group called Please Let Me Live Inc. in Yuba City, California held the first Life Chain in 1987. 2,500 people participated in the event, holding signs that read “Abortion Kills Children” on both sides of streets. The annual event grew by leaps and bounds in the following years, with almost 800,000 people participating in 373 Life Chains across the US by 1991. Canada held its first Life Chain in 1990. Canada boasted 97 separate Life Chains in 1992, with almost 1,000,000 participants in North America that year. A total of 30,000 people took part in Canadian Life Chains in 2013, of which 15,000 were from Ontario. The number of people who participate in this event always increases, with new faith communities attending each year. At the actual event, those participating in Life Chain stand at various intersections with signs that witness to the truth about abortion, in silent prayer. The signs are provided by Niagara Region Right to Life and are distributed by a Zone Captain at each intersection. The Zone Captain is also responsible for organizing and orienting Life Chain participants at the intersection, and will talk to any media that may wish to cover the event. Life Chain is a non-confrontational, peaceful, and silent witness to the evil of abortion and its painful consequences. It is a simple but powerful reminder to our fellow citizens of the sanctity of human life and our duty to defend the weakest members of our society.